National healthcare spending is projected to grow 5.6% annually over the next decade, according to a CMS report published Wednesday by Health Affairs. The new numbers affirm previous projections from government economists that spending growth would accelerate because of insurance expansion under the Affordable Care Act, an aging population and expensive new drugs. The study does not, however, take into account the uncertainty the Trump administration brings to the healthcare sector and how the GOP's plans to eliminate major ACA provisions like premium subsidies and Medicaid expansion might affect spending. “The scope, timing, and impact of such possible changes on health spending and health insurance coverage are all uncertain at this time,” the authors wrote. Republicans in Congress have struggled to coalesce around a comprehensive replacement of the ACA, but a repeal of the law would likely drive down healthcare spending, said Charles Roehrig, founding director of the Altarum Institute's Center for Sustainable Health Spending. Under the ACA, many states expanded Medicaid to adults with incomes up to 138% of the federal poverty level, and millions more bought health plans through the insurance exchanges. But the CMS analysis found that healthcare spending growth between 2016 to 2025 will be largely influenced by changes in the economy and population as opposed to coverage expansion under the ACA. The healthcare law greatly influenced the average 5.5% spending growth experienced in 2014 and 2015 as more people enrolled on the exchanges and gained Medicaid coverage, but those numbers are expected to stabilize. The first two years of the projected period are expected to be the slowest periods of spending growth—4.8% in 2016 and 5.4% in 2017. That reflects an expected decrease in spending by Medicaid, Medicare and private insurers as enrollment slows. 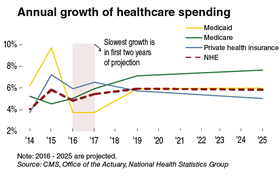 In 2018 and beyond, however, healthcare spending is expected to accelerate, especially for Medicaid and Medicare. The Medicaid population is projected to trend toward somewhat sicker, older and costlier beneficiaries. At the same time, baby boomers will continue to age into Medicare. Medicare spending is expected to grow 5.9% in 2017 and 7.6% in 2025. Medicaid spending is expected to grow by 3.7% in 2017 and 5.9% in 2025. Demand for home healthcare services and expensive specialty prescription drugs will also drive up healthcare spending. Home healthcare spending will be driven by growth in Medicare, particularly between 2020 and 2025 as baby boomers reach their mid-70s. They are expected to choose home healthcare services more often than previous beneficiaries. Home healthcare spending will grow by 7% in 2025. A rise in spending on prescription drugs will be influenced by the increased use of expensive specialty drugs, growing by 6.4% in 2025. That's slower than the 9% growth recorded in 2015, which was driven by the use of expensive hepatitis C drugs and brand name drugs that have since gotten competition from cheaper generics.